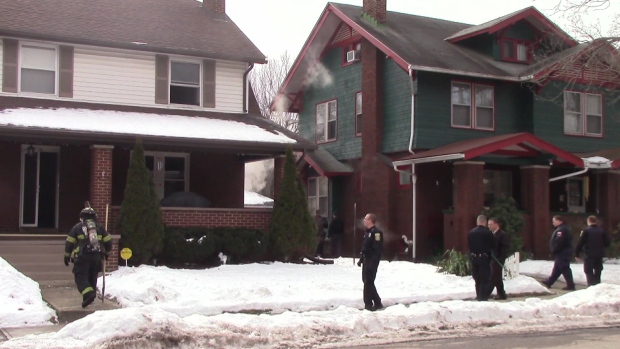 NEW CASTLE (KDKA)- Firefighters were able to bust their way into a home in New Castle and pull a woman to safety. The fire started shortly after noon on Wednesday at a home on East Winter Avenue. Sylvia Petro, 42, called 911 herself to report the fire. She said she was trapped on the second floor and the phone disconnected. New Castle firefighter Shawn Johnson put up a ladder to the second floor, while firefighters Justin Data and Marco Bulisco entered the first floor and began putting out the fire. Sylvia was rushed to Jameson Hospital and later flown to UPMC Mercy Hospital, where she is in critical condition. “It makes you feel good, feel proud to work with guys we work with, they’re all great,” said Data. “When you have the ability to affect someone’s life, their property, and even have an opportunity to save a life, it means a lot to me. It’s what we do, it’s why we are here,” firefighter Marco Bulisco said. Three dogs inside the home got out safely, but one of them ran away. The family is asking anyone who’s seen her to call police. Firefighters also said at least four cats were inside. They had to give two of the cats oxygen at the scene. Fortunately, all the animals survived the fire.